The C.M. Russell Museum, located in Billings, Montana, recently announced it raised $1,035,268 during its annual WesternArt Week auction, procedes of which will help fund the museum’s operation and educational program . Notable among the hundreds of paintings, drawings, and other pieces of western art sold was Charles Russell’s original watercolor High, Wide, and Handsome. 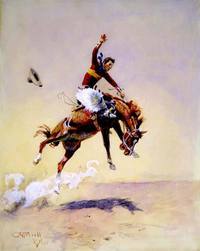 Russell painted the image of the bronc-buster wrangler in 1919, and the painting went for an astonishing $550,000. Contemporary artist R. Tom Gilleon’s oil painting Hair Apparent went for $225,000. But taking a step back from the prices such works garnered from the sale, the auction, and the over 3,400 who visited the three-day event, underscores our continued love affair with the iconic cowboy at work. From Russel to Frederick Remington, from Gene Autry to Kevin Costner, and from Owen Wister to Louis L’amour, the cowboy at work has long been a touchstone of Western American culture.